You can find papers describing all these projects. The following lines explain some of them. 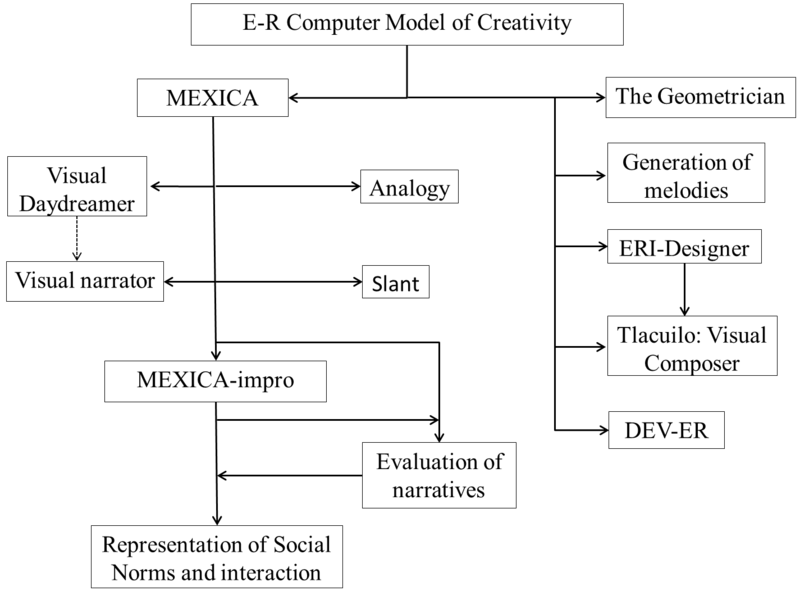 The E-R Computer Model of Creativity is based on Sharples account of creative writing (1999). According to his account, creative writing consists of cycles of engagement and reflection guided by constraint. During engagement the author applies full attention to creating a succession of associated ideas. During reflection the writer reviews the material produced, explores and transforms possible options, produces plans and constraints which guide furthers periods of engagement. These ideas originate the Engagement-Reflection Computer-Model of narrative generation. 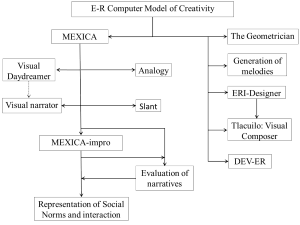 The model is implemented in a program called MEXICA; it produces plots of stories about the Mexicas, the inhabitants, in centuries past, of what is now México City (the system does not work with natural language). Its main purpose is the production of novel, coherent and interesting plots that generate useful knowledge. That is, a creative agent generates at least two types of outputs: a final product, e.g. a plot, and novel and useful knowledge that increases its expertise, in this case the capacity of the program for the generation of narratives. MEXICA generates stories through cycles of engagement and reflection. During engagement an initial action is performed producing a Story-Context. The system looks in memory for a Knowledge-Structure that matches such a context and retrieves a set of possible next actions associated to it. One of those actions is selected as the next event in the story; the action is executed by the system, the Story-Context is updated, and the cycle starts again. During reflection MEXICA evaluates if the material produced during engagement satisfies the requirements of coherence, novelty and interest. As a result of such an evaluation MEXICA produces a set of constraints called guidelines; their purpose is to influence the production of material during engagement. The engagement-reflection model considers evaluation as an integral part of the creative process. The current version of MEXICA is capable of performing two types of assessments: one during plot generation and the other after the story has been finished. The first of these processes evaluates the story in progress; its purpose is to contribute to advance the narrative. The second values the final product; its goal is to determine if the system’s output might be classified as c-creative. Creative processes take place in very complex environments. In order to have a better understanding of these phenomena it is necessary to build computer models that at least combine a social dimension and a cognitive dimension. The interaction between agents provides a useful social setting. Thus, the development of collaborative systems where agents—each one capable of producing individually a final product—work together in the construction of interesting outputs might contribute to the study of creativity. Employing MEXICA as a base, we decided to create a model for the generation of collective narratives named MEXICA-impro. The model for the generation of collaborative narratives includes a cognitive dimension and a social dimension. Because each agent has its own knowledge base and the capacity of producing interesting plots, their interaction allows exploring the links between cognitive and social aspects during plot generation. This project was developed with Nick Montfort and Fox Harrell from MIT, and Andrew Campana from Harvard University. SLANT is a system that integrates more than a decade of research into computational creativity, and specially story generation, by connecting subsystems that deal with plot, figuration, and the narrative discourse. The system incorporates a new perspective on genre and integrates components from three existing systems: D. Fox Harrell’s GRIOT, Rafael Pérez y Pérez’s MEXICA and Nick Montfort’s Curveship. A Computer Model of a Developmental Agent. The model simulates adaptation as a creative activity.